The inherent qualities of water aid healing. Your body is supported in a warm, calming and reduced pain environment. Water is the perfect environment for those who may not be ready for land-based programs. 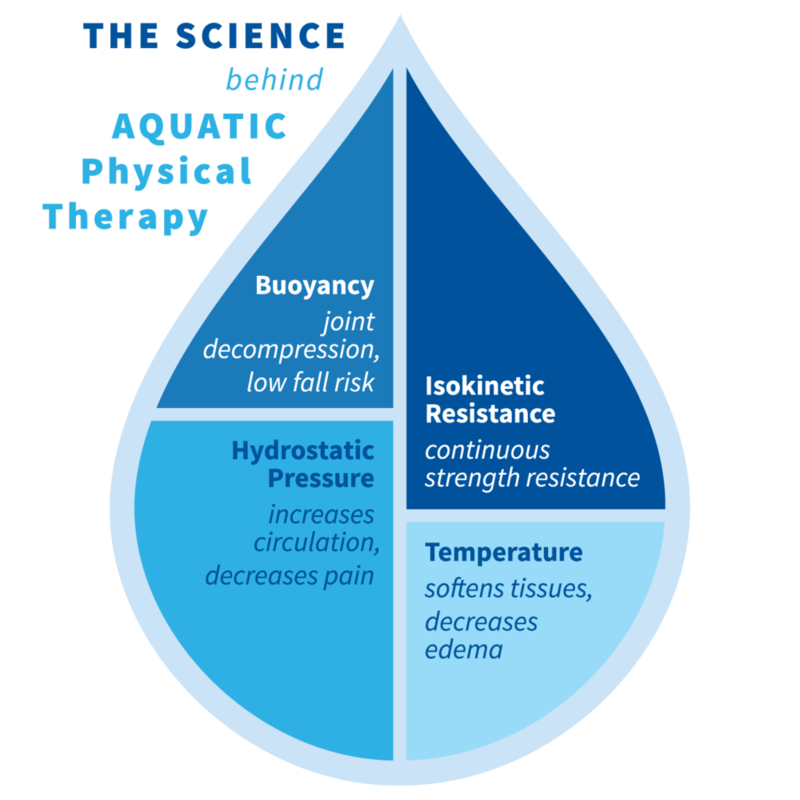 Aquatic Physical Therapy can be initiated earlier with greater comfort following injury or surgery. In the pool, patients feel only 20% of the compression on their joints that they would on land. Patients are able to move with significantly less pain in the water and are able to strengthen, improve their balance, and increase postural awareness in a pain free environment. Patients are able to return safely back to daily activities in a shorter period of time with aquatic therapy than with other types of therapy. To put it simply, water allows patients to do more activity and feel less pain. The upward thrust acting in the opposite direction to the force of gravity. Being submerged in neck deep water reduces your weight by about 90%. The buoyancy reduces compression on your joints and spine and allows for strengthening of muscles without the associated pain that many experience with exercises. Additionally, the support of the water decreases fall risk. The force exerted on an immersed body by fluid molecules. Ever notice how taking a bath will take away some of your aches and pains? The water is basically giving your body a gentle hug. Since water is more dense than air, it exerts a force on you that can help relieve pain, improve circulation, and support your body during your aquatic exercise program. Maintaining elevated water temperatures between 90 and 94 degrees allows patient muscles to relax in order to maximize the benefit of their therapy. Warm water temperatures also lead to improved circulation, which helps to reduce edema and scar formation. We believe in your recovery. Water PT’s team of experienced and caring professionals has years of experience in physical therapy, aquatic therapy, massage therapy and holistic therapy. We understand that your situation is unique. Injuries and illnesses can be debilitating to your body and your self esteem. Our programs and techniques are customized to your specific condition and needs. We want to support you in returning to health and happiness. We are your partner in your healing process. Aquatic Therapy and Wellness may still be new to you. Our team is passionate about finding the right treatment for you. So if you have doubts about aquatic treatments or simply want to find out more, get in touch with us.